Our mission is to provide a dynamic educational environment, by encouraging excellence. All students are challenged to reach their maximum potential by learning at their functional level to provide a solid foundation of skills, knowledge and values. This foundation enables each student to become a well-educated, productive adult who will be able to cope with an ever changing world. Manchester International School vows to provide a dynamic educational environment, by virtue of its steadfastedness towards enabling, encouraging and nurturing excellence. Every student is being provided the perfect platform to discover and develop his utmost potential, whilst also being duly challenged to perform and lay a formidable foundation of skills, knowledge and values at various levels. This platform facilitates our students growing into well-developed and well-adjusted world citizens, consistently achieving higher results that are supremely worthwhile. Obsessed with an unrelenting focus on academic excellence, Manchester International School looks ahead with zeal in upbringing students in a diverse learning environment. 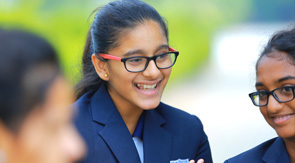 Living up to its fame of being honoured as one of the top schools in India, the prime focus of Manchester International School remains in developing caring and productive global citizens, who are critical thinkers, collaborative, and action-oriented through a truly international quality education. Manchester International School offers to its students, an individualized academic experience, shaped by a transdisciplinary approach that challenges and prepares them to effectively take on the future. Manchester International School ensures to inculcate in their students, the respect and appreciation of people from different cultures, religions, ethnic groups, and socio-economic backgrounds. Manchester International school vows to continually strive and instill an intrinsic desire in the students as to always strive to meet the high expectations they have set for themselves, no matter what their goals are.